Schools, Lake Grove, class photo. 1st row: Jimmy Dickinson; Kirsten Olsen; _ Anderson? ; Margaret Earlenbaugh; Carl Fredrickson. 2nd row: Helen Olson; Kent Worsham; Jerry Anderson; _ Chamberlin; Laurel Lowder. 3rd Row: John Pinkney; James Stevens; __ Brennen; Timmy Durnford; __; Jerry Gilkeson; Mike Kelly. [stamp]: Mr. & Mrs. J.B. McNeil, Commercial Photographers; 8623 S.E. 11th Ave., Portland 2, Oregon. Description Scanned as B & W. Teacher is Clara Hargreaves; sign held by student: Lake Grove School, No. 252, Apr. 14.47. 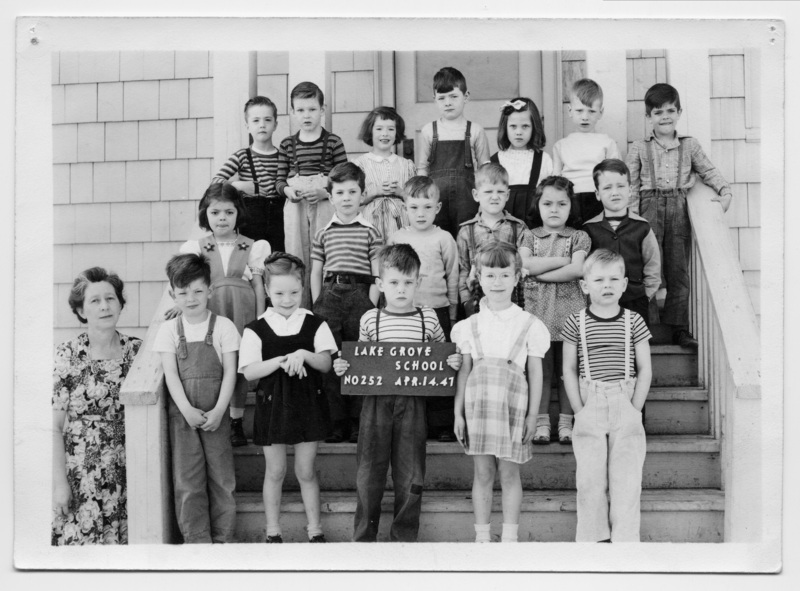 Transcription Schools, Lake Grove, class photo. 1st row: Jimmy Dickinson; Kirsten Olsen; _ Anderson? ; Margaret Earlenbaugh; Carl Fredrickson. 2nd row: Helen Olson; Kent Worsham; Jerry Anderson; _ Chamberlin; Laurel Lowder. 3rd Row: John Pinkney; James Stevens; __ Brennen; Timmy Durnford; __; Jerry Gilkeson; Mike Kelly. [stamp]: Mr. & Mrs. J.B. McNeil, Commercial Photographers; 8623 S.E. 11th Ave., Portland 2, Oregon.